Bake a cake the size that you need. 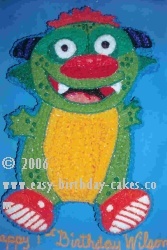 With an icing filled bag and round tip, size #5, draw the monster on the cake top. Cut the cake away from the monster shape. You will use a star tip, size #16 to do all of the fill in work and a round tip, size #5 for all of the outline work. With white icing fill in the white part of his eyes and his teeth. Use black icing to fill in the centers of his eyes and the middle part of his mouth. Use pink icing for his tongue and red icing or the corners of his mouth and the bottom part of his nose. The top part of his nose is done in a light ride icing. Now make a dark green icing and fill in parts around his eyes and his fins on the side of his head. Make a medium green icing and finish filling in around the eyes. To do his shoes, the soles are white with a white button dot on the spats. The spats are orange with the rest of the shoe a light orange. Fill in the crest on the top of his head with orange also. With your dark green icing, fill in all the spots o the monster. Now make a yellow green icing and fill in the rest of his body. Use a golden yellow icing to fill in his tummy. The horns on the side of his head are filled in with a light and darker purple. Now fill in the sides of the cake with sky blue icing. With orange icing, outline the shoes making sure you do the lines on the white soles. Now outline the crest on the top of his head. With the darker purple icing outline the horns. Outline the nose with red. With dark green outline around the mouth and the rest of his body. Browse through the rest of the site to see many other birthday party cakes.